“Follow your gut,” takes on new meaning in RAMEN SHOP, the latest emotionally transcendent film from Eric Khoo, one of Singapore’s most notable filmmakers. Masato (Takumi Saito, 13 Assassins) is haunted by soup, specifically his deceased mother’s bak kuh teh, a Singaporean pork rib “bone tea” originated by Chinese workers. By day, he works in Japan at a famed ramen shop for an emotionally distant father. By night, with a spice-sending blogger (J-pop star Seiko Matsuda) as accomplice, he endlessly tries and fails to conjure the indelible flavor of his memories. When his father dies, a hidden suitcase with his mother’s journal and a message for her son sends Masato flying to Singapore to study bak kuh teh at the source, where he discovers a hostile grandmother, forbidden love, and family rifts swimming in the broth. Mixing photographs and romantic flashbacks, Khoo (Be With Me, SDAFF ‘06) delivers all the stomach-growling scenes we crave: fragrant broths, glistening hawker fare, and ivory fresh noodles. But RAMEN SHOP also serves the transpacific context particular to Singapore. The linguistic mutations of a polyglot mosh pit, where diaspora is in the pores and languages switch without batting an eyelash. An uncle’s almost-viral, verbal shorthand: “Meat must be doing, doing!” “Water must grruu, grruu!” A shouting match across a security door in different languages–neither person understanding each other, both of them in tears. Scenes familiar to many immigrants, where disconnection becomes painfully unintelligible, and new vocabulary is gleefully borne from ideas crashing without dictionary landings. 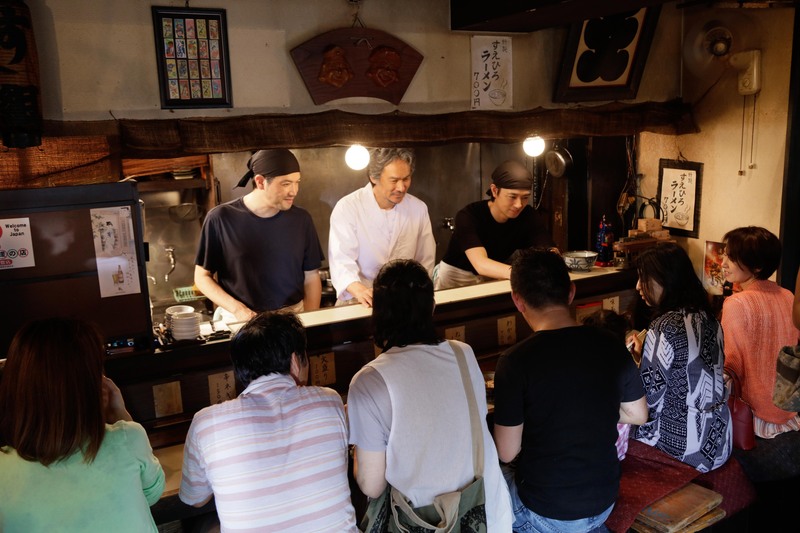 A film dedicated to 50 years of Japan-Singapore diplomatic relations, RAMEN SHOP is ultimately a tender story of family healing without shying away from the political histories tremoring within Singapore’s multi-ethnic fabric. With two iconic dishes, one iconic director, and an ensemble of star performances, RAMEN SHOP’s bowl of soup turns into restorative time machine, bringing reconciliation between the living and the dead and deliciously unimagined possibilities for the future.